Norma spotted this one at her kid's school in Plymouth, MA. 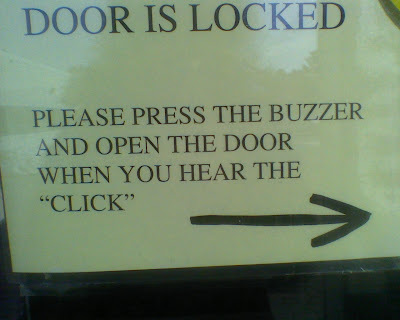 She writes, "I must say, the quotation marks may not be entirely unnecessary in this instance, as the sound of the door unlocking is actually more akin to a gunshot than a 'click,' in my opinion." Hey, this one almost makes a little sense since, you could, "conceivably" imagine the door saying the word "click" or, I guess, "bang." Yeah, it's pretty standard to use quotation marks on an onomatopoeia. Quotes are ok here, due to the word being onomatopoeia and it is illustrating a sound.